Ground up bones rubbed into pots, possible skull binding, and alignment of megaliths for rituals involving the southern moon are coming to light with exciting new research into the enigmatic Beaker people of northern Scotland. These mysterious people arrived in Scotland about 4,500 years ago and brought bronze metallurgy, the wheel, and a new type of stone circle with them. Like earlier people of the British Isles and Europe, they had megalithic stone circles, but the Beaker people’s circles stand out for having a large stone lying on its side (recumbent), surrounded by other megaliths. The recumbent stones are aligned with the arc of the southern moon. For this reason, researchers think the people practiced rituals connected with the moon. There are about 200 such circles with recumbent stones. This type of megalithic circle with a recumbent stone is known only in Scotland’s Aberdeenshire and in Ireland’s far southwest for certain. However, it has been suggested that the Beaker people also built two incomplete circles inside Stonehenge, which is far to the south of northern Scotland. Researchers have recently gained a greater understanding of the Beaker people by analyzing burials and using scientific dating and isotope analysis of the skeletal remains to track their prehistoric movements. The Daily Mail says researchers have found the Beaker people introduced a less central political authority, which brought an end to the ancient Britons’ building of monuments. Their territory in northern Scotland was also apparently a trade hub. Beaker burials are distinctive and include Beaker ware or pottery, hence their name. Male remains were situated on the left-side facing east, and women on the right-side facing west. Many of the female burials had infants placed in the grave as well, which indicates the peril of giving birth in the early Bronze Age. Neil Curtis of Aberdeen University museums and Neil Wilkin of the British Museum’s British and European Bronze Age collections are the chief researchers on the recent project focusing on Beaker burials in northeast Scotland. They found that the burials include a distinctive feature: beakers, or pottery drinking vessels placed in the graves, were rubbed with a white powder of ground bone matter. This practice is thought to be unique to Scotland’s northeast. Researchers don’t know if the bone powder was of animal or human origin. While archaeologists believe the practice of rubbing ground bone into beaker vessels is unique to northern Scotland, the Beaker People lived in a large area of Europe. Their sites are found all over Northern Europe, extending into Ukraine and southwards into Austria. As Ancient Origins reported in July 2015, the Funnel Beaker Culture or TRB (Tricherrandbecher or Trichterbecher in German) was a society related to the more well-known Beaker culture (or ‘Beaker People’). This society was the first farming community in Northern Europe, having abandoned a hunter-gatherer lifestyle in favor of growing wheat, barley and legumes and rearing livestock such as cattle, sheep and goats. Most of their settlements consisted of houses that were little more than temporary structures made of wooden poles. However, they often featured a number of burial monuments, usually made out of wooden poles, in which people were interred over a number of generations. These monuments became impressive passage graves with walls and roofs as the poles were replaced by stone chambers constructed from glacial boulders. In contrast, the scientists doing research into the Scottish Beaker People found that the beaker pots buried with their dead were contemporaneous with metalworking of bronze and the building of recumbent stone circles. “It seems as though North-East Scotland was one of the first places to make bronze in Britain, drawing on skills from the Netherlands and beyond, copper from Ireland and tin from Cornwall,” Mr. Curtis told the Daily Mail. Another distinctive feature of the Beaker people is that some individuals were found to have had short and round skull shapes that may have resulted from deliberate head-binding. One example of this practice was found by researcher Maya Hoole. Hoole reconstructed a Beaker woman’s face in two dimensions. 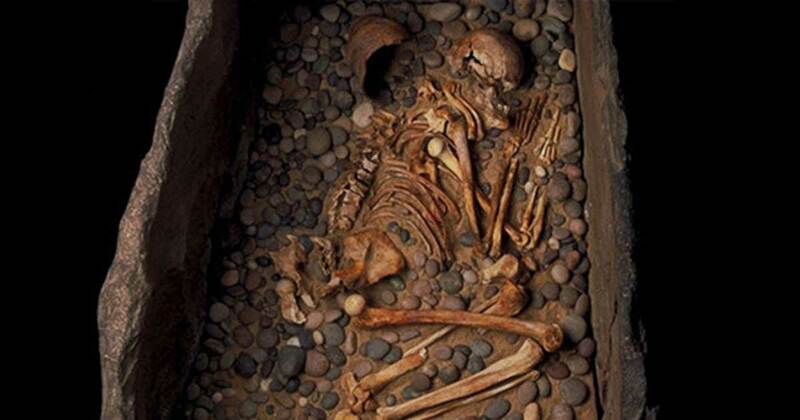 The woman is known as Ava and died about 3,700 years ago. The uneven, abnormal shape of her skull and her burial in a grave hewn from stone reveal she had a special significance in her culture. Ava’s grave was found in 1987 in the far north of Scotland at Achavanich near Caithness. The reason these people bound skulls and rubbed beakers with ground up, incinerated bone and placed them in graves is unknown – it is a mystery that researchers may never solve.